Age Limit: Age for both the post will be between 18 to 27 years. The upper age limit is relax-able to maximum 5 years (10 years in case of candidates belonging to SC/ST and 8 years for candidates belonging to OBC category). • Sports person who have represented a state or a country in a National or International competition in any of the games mentioned above. • Sports person who have represented the University in Inter-University tournaments conducted by the Inter-University Sports Board in any of the game mentioned above. • Sports person who have represented the state school Teams in the National Games for school conducted by All India School Games Federation in any of the game mentioned above. The candidates are advised to send their application in a prescribed format (Form-A) on a plain paper giving full particulars to the above given address. Candidate has to attach 2 self addressed envelopes (size-27cm x 12cm) duly stamped. The candidate should furnish certificates in support of their claims in the prescribed form (Form-B) duly signed by prescribed Authority. The forms can be downloaded from the CAG recruitment website (www.cag.gov.in). Download the application form format from the link given below. You can also comment the article if you get any doubt regarding this CAG recruitment. • Candidate must have pursued bachelor degree with minimum 45% marks or equivalent grade in any of the discipline like Arts/ Commerce/ Social Science/ Sciences/ Mathematics/ Statistics/ Medicine/ Engineering and Technology. • The Bachelor Degree should be of deemed University/any Recognized University or University of Delhi. • Candidates must have Graduate degree with minimum 45% marks in Medicine (MBBS)/ Dentistry (BDS)/ Biotechnology, Genomics/ Genetics/ Nursing/ Bio Engineering/ Alternate System of Medicine/ Paramedical Discipline/ Pharmacology/ Anthropology/ Zoology. Experience for FMS Delhi Recruitment: Candidate should have at least five years of experience as an executives or an administration in a commercial/ industrial/ government establishment/ registered organization after passing the Bachelor Degree Program. The candidates are informed to fill the online registration form at FMS Delhi website (www.fms.edu) and then send the documents to the above given address by paying the requisite fee of Rs. 1000/- (350/- for SC/ST candidate with disability category) for each program. Download the full notification for all details. If you have doubt regarding FMS recruitment, comment on this article. Method of Recruitment: Deputation (including short term contract basis). • Degree in a agriculture of recognized University. • Post Graduate Degree in Agronomy. • Ten years experience in planning and organizing fodder farming or research extension on a farm connected with fodder production, grasses and pastures. Method of Recruitment: Promotion/Deputation (including short-term contract) basis. The applicants are need to send their application in the prescribed format to the above given address. The name and the post applied should be subscribed in bold letter on the envelope containing application form. For more details about the qualification and bio-data proforma etc, visit the DAHD website (www.dahd.nic.in). You can comment the article if you get any doubt regarding DAHD recruitment. Qualification: Post Graduate Degree with 21 years experience as a Class I Officer in Schedule ‘A’PSU/Armed Force/Central Police Organization. • Graduate Degree in Engineering with minimum 60% marks and MBA with specialization in Material Management. • Graduate Diploma in Materials Management awarded by Indian Institute of Materials Management. • 16 years experience for Departmental candidates and 18 years of experience for others. • Graduate Degree with ICWA/CA or MBA with specialization in finance with minimum 60% marks. • 16 years experience for departmental candidates and 18 years experience for others in class I. • 2/3 years experience in Forest Department as Assistant Conservator of Forest (ACF). • 2/3 years experience in Revenue Department for LAQ as Nayab Tehsildar. • For E6 Level: UR 50 years, OBC-53 years. • For E4 Level: UR-44 years, OBC-47 years, SC/ST-49 years. • For E2 Level: 40-50 years. How to Apply: The willing candidates for ONGC recruitment are required to send their application to the above mentioned address. The application format will be downloaded from the ONGC website (www.ongc.co.in). ONGC website may take some time to open due to heavy traffic on it. An amount of Rs. 500/- for the candidates applying against posts for UR/OBC and Rs. 100/- for the candidates applying against post for SC/ST will be charged as application fee. Application fee will be deposited to any branch of State Bank of India. • At least 18 years experience in line out of which 3 to 4 years in remote sensing and geometrics/ in radiometric dating. • Post Graduate Degree in Geophysics & Physics with Electronics or M.Tech with minimum 60% marks. • At least 18 years experience out of which 3 to 4 years exp in Log Data Processing. • Post Graduate Degree in Geology/Chemistry/Geophysics/Mathematics/Physics/Petroleum Technology with minimum 60% marks. • At least 18 years exp in line out of which 3 to a4 years exp in Water shutoff & EOR studies/Flow assurance in high waxy crude oil. • At least 18 years line exp out of which 3 to 4 years exp in petroleum microbiology in oil industry. • At least 18 years line exp out of which 3 to 4 years experience in project management of deep/ultradeep water technologies. • Ministry of Transports Certificate of competency of Master Foreign Going with 3 years experience as second officer. • At least 18 years experience in line out of which 3 to 4 years experience in design, supervision & operation of FPSO. Role: Expert-Matrix acidisation of carbonate & sandstone HPHT reservoirs. • At keast 18 years experience in line out of which 3 to 4 years exp. In development of Chemical Formulation, Job design and post job evaluation. Role: Expert subsea flow Assurance & pipe line design. • Graduate Degree in Chemical/Mechanical/Petroleum Engineering/Applied Petroleum Engineering with minimum 60% marks. • At least 18 years experience in line out of which 3 to 4 years experience in FEED for flow assurance including subsea equipment selection, design and verification. • Proficiency in software like OLGA, Pipesim. Prosper, LSTAB etc. • At least 18 years experience in line out of which 3 to 4 years experience in subsea equipment selection, pipeline botton, stability, analysis and control system simulation for FEED, proficiency in software like LSTAB, control simulator, questor & OGM. • At least 18 years experience in line out of which 3 to 4 years experience in concept, design and operation in GTL Processes and relevant software. • At least 18 years experience in line out of which 3 to 4 years experience in various natural gas cryogenic processes. Role: Expert-Sand control and Water & Gas shutoff in carbonate & sandstone reservoir. • At least 18 years experience in line out of which 3 to 4 years experience in water, gas and sand control techniques. • At least 18 years experience in line out of which 3 to 4 years experience in completion and testing of smart & HPHT wells. Age Limit: The minimum age will be 42 years for all the posts and categories. In exceptional cases, the minimum age can be relax able to 40 years with the approval of competent Authority. The upper age limit will be 56 years for all posts and category. It can be relaxable to one more year for the Competent Authority. How to apply: The candidates are required to send the application form to the address given above. An amount of Rs. 500/- for candidates against posts for Gen/OBC and Rs. 100/- for the candidates applying against post for SCs/STs. The application form will be submitted to any branch of State Bank of India. You can get any other information and download the application form from ONGC website (www.ongcindia.com). The website may take some time to open due to heavy traffic on the website. If you get any doubt regarding ONGC recruitment, comment on this article for an appropriate solution. Directorate of Oil Plam Research (DOPR) has invited application for the recruitment of Assistant Finance & Account Officer. The interested candidates are required to send their application in the prescribed format given below. Application should be sent to the following address. How to apply: Download the advertisement from the link given below. Read it carefully and follow the steps. The willing candidates are required to log-on to the DOPR website (dopr.gov.in/Advertisements.htm) to get the details like age limit, educational qualification, experience required etc. If you get any doubt are this DOPR recruitment, post your comments on this article for suitable solution. This institute has a research centre at Palode near Thriuvanathapuram, Kerala. Research on Oil plam under irrigated conditions is practically a new start and Indian Council of Agricultural Research established the National Research Centre for oil Palm at Pedavegi in West Godavari district of Andhra Pradesh on 19 February 1995. North Eastern Electric Power Corporation Ltd. (NEEPCO) has invited application for the recruitment of Trainee Personal Officer and Trainee Account Officer. The interested candidates are required to send their application in the prescribed format before 9 December 2013. Applications should be sent to the following address. Qualification: The candidates must have CA/ICWA or Graduate Degree with full time MBA or Post Graduate Degree/Diploma of minimum two years duration with 55% marks in Finance. How to Apply: Download the detailed notification and application form from the link given below. The candidate should send three copies of passport size colour photograph, one copy should be affixed in the space provided in the application form & two copies should be sent along with application to the Sarkari Result and candidates should write their name & post applied for in the back of photographs. The candidates should send the duly filled & signed application form enclosing all academic, professional qualification certificates/testimonial/marksheets, Caste certificate (in case of OBC, non – creamy layer certificate), PwD Certificate, Experience certificate, etc or any other relevant documents. Write the advertisement Number, Post applied forwith code in Block Letters in the envelope. Send the application form two the above address given after first paragraph. You can comment on this article, if you get any doubt regarding this recruitment. North Eastern Electric Power Corporation Limited, a Rs. 5,000 Crore premier Schedule-‘a’ “Mini Ratna” Category-I Central Public Sector Enterprise in the North Eastern Region of India and engaged in planning, designing & executing power projects both hydro & thermal and in consultation business in the Power Sector. NEEPCO has installed capacity of 1130 MW Which is 47% of the total installed capacity of the N.E Region. Assam Public Service Commission (APSC) has released the notification for the recruitment of Assistant Engineer (Mechanical) under Irrigation Department, Assistant Engineer (Mechanical) in the Directorate of Geology & Mining, Assam under Mines & Minerals Department and Assistant Engineer (Electrical) under Irrigation Department. Only the Indian Citizens are eligible for the recruitment. Age limit: 21-38 years as on 1 January 2013. Up to 5 years’ age relaxation for SC/ST and 2 years’ for Ex-serviceman. Educational Qualification: Candidate must pass BE Degree in concerned discipline from any institute recognized by AICTE. Pay scale: Rs.12,000 – 40,000/- (PB-4) plus Grade Pay of Rs.5400/- plus other allowances as admissible. Age limit: 21-38 years as on 1 January 2013. Up to 5 years’ age relaxation for SC/ST. Educational Qualification: Candidate must be Graduate in Automobile Engineering or Mechanical Engineering from any University recognized by the Government. The candidates having working experiences in the line will be given preference. Pay scale: Rs. 12,000/- to Rs. 40,000/- plus Grade Pay of Rs.5400/- plus other allowances as admissible under the Rules. The candidates can get the application form from the Issue & Receipt Section of the Assam Public Service Commission, Jawahar Nagar, Khanapara, Guwahati-22 up to 4.00 PM during office hours except holidays OR download it from the APSC website (www.apsc.nic.in). You can read other details in the official notification from APSC. Download it from the given link. If you get doubt regarding APSC Assistant Engineer Recruitment 2014, post your comments on this article for suitable solutions. Department of Revenue, Ministry of Finance has invited application for the vacancy of member of Central Board of Direct Taxes during the year 2013-2014. Interested candidates are required to send their application to the revenue (headquarters) before 6 November 2014. Application must be sent in a prescribed format. The information about the recruitment are listed below. • Officers of the Central Government having one year regular service with pay scale of Rs.67,000-79,000/- per month. • i). Candidates must have at least fifteen years of experience in administering and running the direct tax administration in the Central Government with at least ten years of experience in the field formations of Central Board of Direct Texes. ii). Must have high professional merit and excellence. iii). Must have impeccable reputation of integrity. Age Limit: 56 years as on the date of closing of application. How to Apply: The willing candidates can download the application form format from the link given below. Fill your application form in the prescribed format and send it before 6 November 2014. If you get any doubt regarding this recruitment, post your comment on this article for suitable solution. • PhD qualification in concerned discipline. • Ten years of teaching experience in college/university. • Contribution to educational innovation, design of new curricula and courses, and technology mediated teaching learning process. • Good academic record with at least 55% marks. • The candidate must have cleared the National Eligibility Test (NET) conducted by the UGC or CSIR. • PhD degree in a concerned discipline. • A Master Degree with at least 55% marks. • A minimum of eight years of experience in teaching. • 10+2 or equivalent qualification. • Typing speed of 35 w.p.m. in English and 30 w.p.m. in Hindi on computer. • 2 year experience as Cook in a Hostel/Guest House/Canteen/Mess. • ITI in the relevant field. How to apply: Download the application form from the given link. The candidates are required to enclose their service particulars, experience and educational qualification with their application form in the prescribed format before 23 December 2013. If you get any doubt related to this recruitment, place your comment on this article. 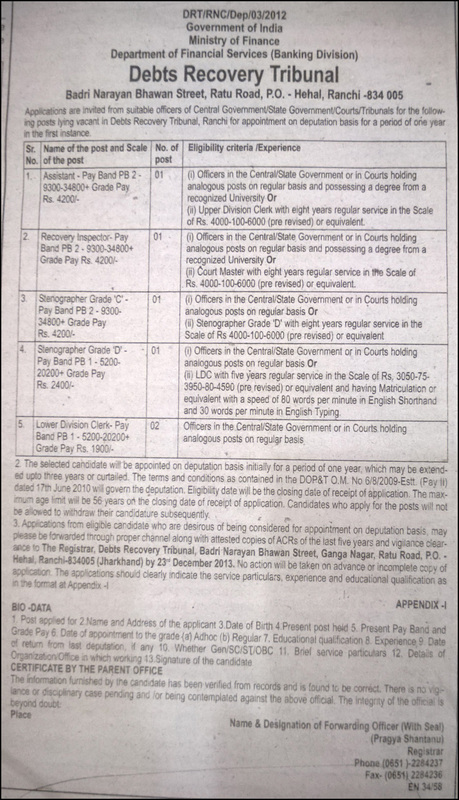 Depts Recovery Tribunal has invited recruitment for the post of Assistant, Recovery Inspector, Stenographer Grade-C, Stenographer Grade-D and Lower Division Clerk from suitable officers of Central/State Government/courts/Tribunals. The desired candidates are advised to send their application to the given address by 23rd December 2013. • Officer in the central/State Govt. or in Courts holding analogous post. • Upper Division Clerk with eight years regular service in the scale of Rs. 4000-100-6000 or equivalent. • Court Master with eight years regular service in the scale of Rs. 4000-100-6000 or equivalent. • Stenographer Grade ‘D’ with eight years regular service in the scale of Rs. 4000-100-6000 or equivalent. • Having Matriculation or equivalent with a speed of 80 words per minute in English short hand and 30 words per minute in English typing. How to apply: Download the application format from the given link. The candidates are required to enclose their service particulars, experience and educational qualification in their application. Send the application in the prescribed format to the above address mentioned after first paragraph before 23 December 2013. If you get any doubt related to this recruitment, you can comment on this article. 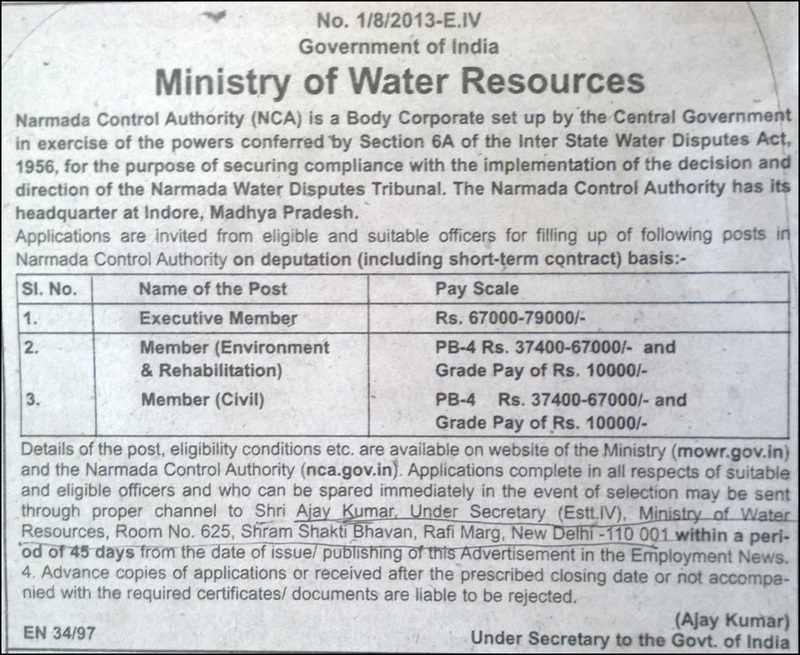 Ministry of Water Resource, Narmada Control Authority (NCA) has invited application for the recruitment of Executive Member, Member (Environment & Rehabilitation) and Member (Civil). 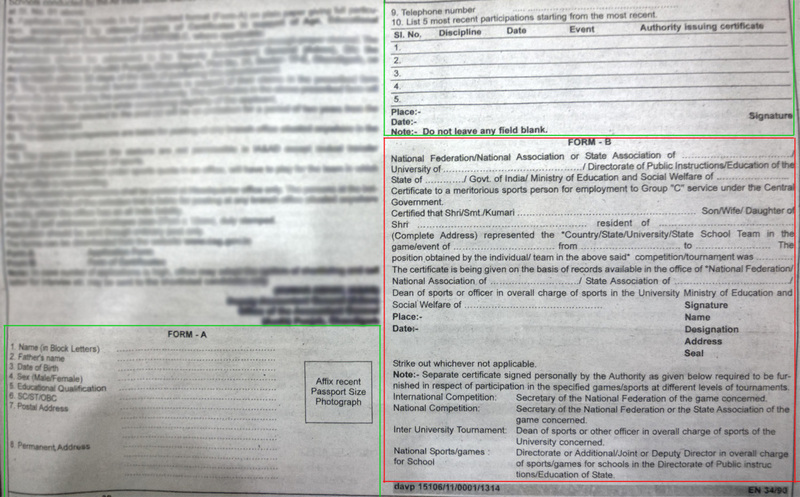 The willing candidates are required to send their application to the given address within 45 days of notification released (23 November 2013). Rafi Marg, New Delhi-110 001. • Degree in Engineering/ Environment/ Social Science. • Overall experience of 5 years in Policy, Planning and Coordination aspects of Water Resources. • Overall experience of 5 years in planning, formulation/ execution of large, major and multipurpose river valley projects in the irrigation/ power sector. • Degree in Civil/ Electrical/ Mechanical Engineering. Last date of application submission: within 45 days. How to apply: You can download the application form and official notification from the Sarkari Result website. You are required to send the application form in the prescribed format to the address given after first paragraph within 45 days from the publishing date of advertisement in Employment News. NCA is a body controlled by the Central Government by section 6A of the interstate Water Dispute Act, 1956. It has its headquarter at Indore, Madhya Pradesh. With three(03) years’ regular service in the grade rendered after appointment thereto on a regular basis in the Stenographers Grade in the pre-revised scale of pay of Rs. 5500-9000 or eqvt. In the parent cadre or department. How to Apply: The eligible and willing candidates should send their application for the post in the enclosed format (Annexure-I) through the cadre controlling authority, address is listed above, after first paragraph. You can download the official notification and application from the given link. All the details about this recruitment are available in official notification. If you get any query related to this recruitment, you can share it with us by posting comment on this article. The National Fire Service College, Nagpur is going to invite application for the post of Fireman. NFSC, Govt. of India, Ministry of Home Affairs, Nagpur will publish the prescribed proforma in the Sarkari Result on or before 26th November 2013. National fire service college is one of the premier institute for fire and safety management it provide various graduate and engineering courses in fire and safety management. For the aspirants who want to make their career in fire and safety management the NFSC Nagpur may be the preferred choice because it offers various courses in engineering and other graduate level disciplines. The NFSC Nagpur was established in 1956 at Rampur(U.P.) and was later shifted to Nagpur(its current location), with the main idea of providing the training courses for the Fire Service personnel of the country the expert committee meeting was held in 1950 for the purpose of building a premier institution for fire and safety management the result of this meeting was the origin of National fire service college Nagpur the college functions under the Ministry of Home Affairs, Government of India, New Delhi. The NFSC Nagpur provides the various course along with the practical exposure, the college is equipped with good infrastructure and state in class labs to demonstrate technical and operational aspects of Fire prevention and Protection and Fire Fighting. Visit the NFSC Nagpur official website to get official notification. You can share your queries by commenting on this article.